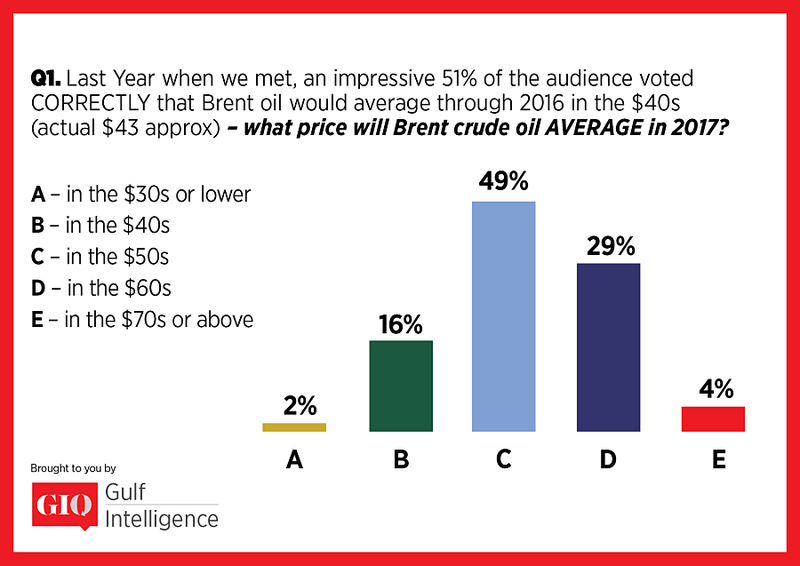 Abu Dhabi, January 12, 2017 (Gulf Intelligence) – The average Brent oil price will be in the $50s/bl this year, according to 49% of respondents to a GIQ Industry Survey (Click on the link for the full report) of 250 energy national and international industry professionals. Comparatively, nearly a third (29%) expect the average oil price to be in the $60s/bl, which is a major turnaround from this time last year when prices dipped below $30/bl and hit a 12-year low. The relatively bullish sentiment is supported by the International Energy Agency’s (IEA) forecast that global oil supply will move into a 600,000 b/d deficit by June if OPEC and nonOPEC producers sustain the supply cuts that were agreed in late-2016. Some respondents (16%) clearly have their doubts on whether the deal will hold and expect the average price to be in the $40s/bl. 59% of survey respondents believed prices would not dip below $40/bbl and a similar percentage said they would not rise beyond the $60s/bl. Almost a third of the audience (28%) were, however, more bullish, expecting that the highest prices hit may be in the $70s/bbl. The majority (74%) of respondents said OPEC’s recent agreement to cut supply alongside nonOPEC producers – the first such deal in 15 years – represents OPEC’s flag of surrender after a two-year fight for market share. Some oil producers, however, such as the UAE, have countered that opinion, emphasizing that the supply cuts, which should lead to a higher oil price, are targeted at bolstering investment into the energy sector, which has witnessed a drop for the past three years along with oil price erosion. Wood Mackenzie released a report this week saying that it expects investment in exploration and production worldwide to rise by 2% in 2017 to $450 billion. But, energy investments do not only rely on OPEC and non-OPEC producers’ ability to stick to the rulebook – the political scene will also have a major impact in 2017. In a recent report, the Eurasia Group said that 2017 marks the most volatile political risk environment since the second World War. Given three political risk choices to rank in the survey, most GI respondents (65%) said that US President Elect Trump’s ‘America First’ philosophy would have the biggest ramifications on the global energy industry. Nearly a third (27%) said the likely overreaction by China to geopolitical events ahead of its 19th Community Party Congress leadership shuffle in September, will have the most significant impact on energy dynamics. On a longer-term basis, 48% of respondents expect it to be sometime in 2018 before the inventories of crude and refined oil in industrialized nations – which remain 300 million barrels above their five-year average – to be cleared. A fifth (21%) of respondents said late-2017 is more likely, while another fifth expect it to be in 2019. As with the respondents’ price forecasts, their expectations for supply are within a relatively defined range. Gulf Intelligence is a UAE-based strategic communications consultancy that facilitates critical Knowledge Exchange and Networking between stakeholders operating across the South-South Corridor -- connecting Government Related Entities in the Middle East and their International Partners trading across this New Silk-Road passageway from Asia to Africa.